Looking to set up a website using WordPress, one of the world most popular content management systems? Assess your skills (ftp, html, css, php) and what you are prepared to do yourself, and how good you are at educatng yourself using the web. Then consider your options. they’ll keep you up to date with wordpress at least. if you want to allow comments, wordpress.com has good antispam built in, althoiugh you can also add that feature (akismet) in to a self hosted site. totally reliant on them – if they disappear, so do you (unless you have figured out a way to keep own backup of your site and can arrange hosting, reload of site and repoint your domain name. That said, this is what you would have todo on a self hosted site anyway. If you don’t know what you are doing, you either need to hire some one or you will get into trouble. Have to add in what comes automatically at wordpress.com. With shared hosting (own server costs approximately $200/month), you are sharing the server – this reduce costs but if the other guys are up to no good…. That said a good wordpress host will normally switch servers for your promptly if you suspect a problem. 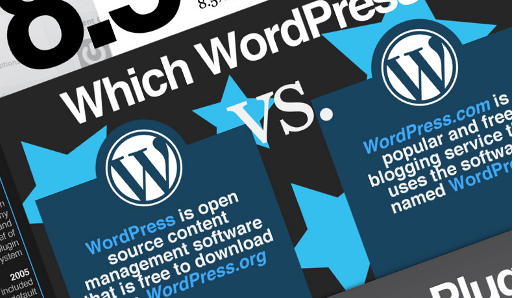 A reasonably good summary of WordPress.com vs. WordPress.org at wordpress.com. Wp-beginners comparison via an info graphic. They end up advocating a self hosted solution for control and avoiding any profit sharing. how much you are prepared to pay for someone to assist you if you need assistance. It is free to open a wordpress.com site, so give it a go – you’ll need it anyway if you want to use their anti-spam service askimet, or the wordpress.com stats via the jetpack plugin. If you are comfortable with doing many things yourself or are prepared to hire the skills you need, and know how to test your website and any plugins you add, consider going with a self hosted solution. You can either do it yourself – there are heaps of guides out there.